My name is Yashodha Bhattarai and this is my story. I was born and raised in Kathmandu, the capital city of Nepal, after my father, a police constable with the Nepal police, was transferred to the city. I am the first of three children, our family of five lived in one small room. My father’s salary wasn’t enough to make ends meet, but my uneducated mother found work so they could enroll us in a private school. After I finished high school, I pursued science with the hope of becoming a doctor one day – until the day my path changed. It happened when my father took me to my ancestral village (Khotang), which is located in the eastern part of Nepal. As we were strolling through the village he showed me the airport that was under construction, on the very site where my father and his brothers fetched wood as children. Manamaya Airport at Khanidanda was to begin commercial operations the following year, and it was there that I felt my first pull to aviation. Watching my father experience nostalgic feelings as he remembered his childhood was the moment I decided I wanted to be a pilot. My initial plan to become a doctor was based on the scholarships the government provided. I encountered a painful truth when I discovered there was no government scholarships or bank funding for pilot training, I didn’t have the fortune I would need to become one. Moreover, Nepal didn’t have a pilot training school at that time. Though there was a flight training school called Siwani Air in Bharatpur, it had closed down due to lack of aircraft and a navigation system. I had already quit my medical preparation, I went from one education consultancy to another trying to find out how much my flight training would cost: USD 40,000, close to four million Nepali Rupees. There was no way my parents could have arranged that amount of money, my dream of becoming a pilot was shattered. I don’t remember how many days I cried. For months, I consoled myself in meditation and books, until the day I read this: “Everything you want is coming. Relax and let the universe pick the timing and the way. You just need to trust that what you want is coming and watch how fast it comes”. I believed I would one day have the money. And then my prayers were answered. In 2009 my father was selected for a UN peacekeeping mission in East Timor. The salary he received wasn’t enough to fund my training but it gave me confidence to borrow money from friends and relatives. After five months of agonizing I went to the Philippines for my training. I was the only girl in a group of eight males, seven from Nepal and one from South India. At the Philippines Pilots Academy, which was located in Plaridel, Bulacan Province, I was outnumbered. I found it difficult to get along with the students. Most of them came from a upper middle class families, and as they said hurtful things, they made me feel less worthy. They said I wouldn’t make it past my first flight and I wouldn’t find a job back home. Added to this I am a vegetarian and I found that to be challenging in the Philippines. To make things worse, I lost my wallet, my return ticket and cell phone while travelling. Maybe things would get worse, but I told myself they had to get better. I passed my exams before everyone else and was released for solo fight before them. I flew solo in a Cessna 150 with a call sign of RPC-1128. I can’t express the happiness, the euphoria I felt the first time I flew solo. My love for aircraft and my passion to fly grew stronger. My perception of life changed the moment I was in the sky, and I became a different person in the aircraft. I was criticized over and over by my male colleagues when I tried to help them and I was made to feel that women could never become captains. Though there were already female captains working for reputable airlines like Yeti Airlines and Buddha Airlines in Nepal, the data showed that of the 214 commercial pilot licence issued by the authority, only 24 were female pilots. There was this idea that men were superior to women because the society we lived in allowed men to be the dominant gender. Because of practices and culture, men were generally viewed as providers, protectors of family and society. From ancient times, men were glorified in battle, preferred at birth, given priority everywhere. In my opinion, there is no superior gender. Men might be superior to women in certain tasks, but women are superior to men in others. Those who saw that men are better than women at certain tasks generalized that men are better than women. And though this stereotype is prevalent, the truth is none of us can survive without the other. It took me months to get over this, so I could move on. I stayed a year in the Philippines to complete my training, earning my CPL in November 2009 and then I returned to Nepal. I finished my CPL written exam, which was valid for five years. If I could get a job, I would have a Nepali pilot licence in that particular type aircraft. In 2010, with the aviation industry in Nepal in a recession, getting a job as a commercial pilot was very difficult. There were hundreds of young men and women who had spent million of rupees to undergo training to become commercial pilots, who were also unemployed and broke. My dreams failed to take off when I realized this truth. I had come a long way from desperately finding the money I needed for the training – I had broken many social barriers and challenged the patriarchal social structure – and to no avail. The search for a job proved to be difficult. Many of those who found jobs got them not because of their talent, but because their parents pulled strings. According to one report, there were more than 250 unemployed pilots in Nepal, where there are only a handful of aircraft belonging to only a few airlines. My chances of getting a job were close to zero. The epaulettes on my white shirt with two golden strips and the wing insignia on the pocket were the only things that remained of my dream as I remained unemployed for almost five years. I took on odd jobs to pay off loans and manage my expenses. My parents had gone beyond their means to support me, selling whatever they had to finance my training. After five and a half years I was hired by Simrik Airlines. They had two Beechcraft 1900 and Dornier 228 aircrafts. I was trained on the Dornier 228 and earned my Nepali pilot licence on June 23rd 2015. I was the only female pilot at Simrik Airlines. The Dornier 228 operated flights to remote STOL (short takeoff and landing) sectors like Lukla, Phaplu, Jomsom, Simikot, etc., carrying passengers and essential supplies like food and medicine. 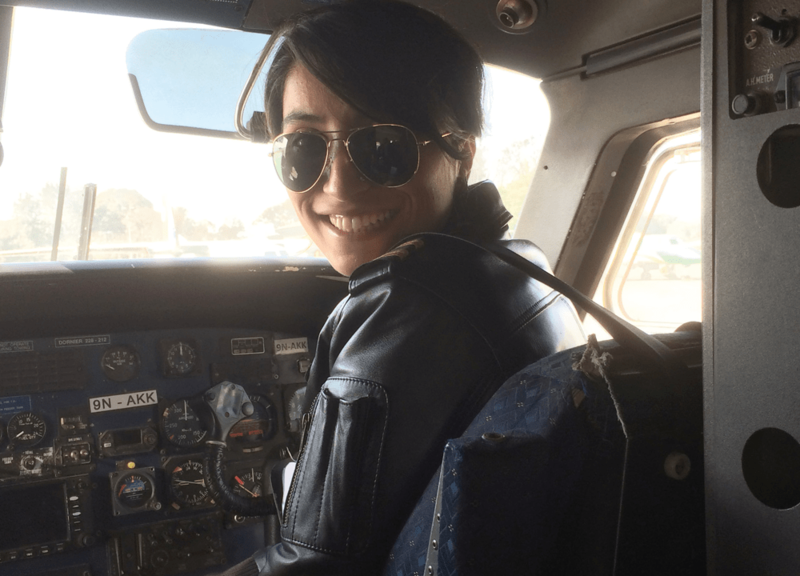 Though there have been many female pilots who flew Twin Otter and Dornier to this remote sector, there has never been a female captain in the STOL sector. Men have long dominated STOL sectors in Nepal. Female pilots who were about to become captains were transferred to Non-STOL sectors like Biratnagar, Nepalgunj, Bhairahawa. When asked for the reason of this gender disparity some noted that it wasn’t a job for a woman. It has been the management practices for decades not to release a female captain to STOL sectors, this is a reflection of where our country is moving in terms of gender equality. As I write this article, I am the only female pilot in private airlines who flies to STOL sectors, mainly Lukla. About a year ago I moved to Tara Airlines, where I found hope. They are encouraging me to become the first female STOL captain. Though I can only imagine that day, I look forward to when I will become one. STOL sectors have unique challenges with upslope runways, high terrain, difficult approaches and unpredictable weather. STOL sectors are filled with many challenges requiring that pilots are highly professional and disciplined. Despite being highly qualified, Nepal has witnessed many fatal airplane crashes involving commercial passenger flights. On 27 May 2017, I lost a good friend in a plane crash at Lukla. Though this incident hasn’t held me back, I have a lot to improve, a lot to learn and a lot of challenges to face in the days and years to come. Recently I married someone who is also a pilot flying J-41 in Yeti airlines. I feel fortunate to have a partner who understands and supports me. I am up for every challenge that I will face in my career, and I am excited for all of the good experiences and opportunities to come. Yashodha Bhattarai is a First Officer with Tara Airlines in Kathmandu, Nepal.